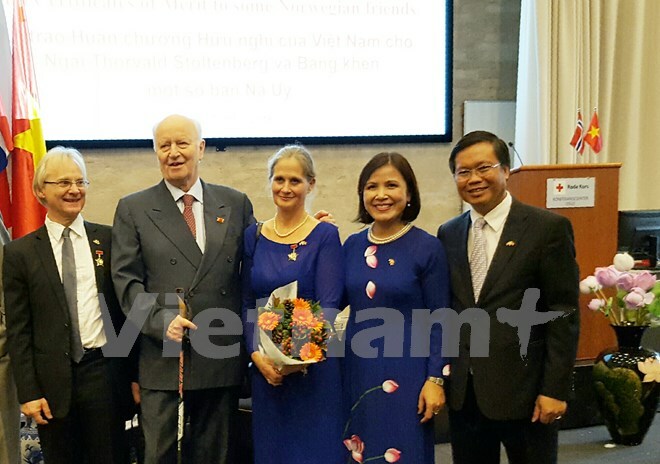 London (VNA) – A Friendship Order of the Vietnamese State has been presented to former Norwegian Minister of Foreign Affairs and Minister of Defence Thorvald Stoltenberg to honour his substantial contributions to the two countries’ amity. The presentation, held by the Vietnamese Embassy in the UK on October 27, was attended by Deputy Speaker of the Norwegian parliament Svein Roald Hasen, State Secretary Tone Skogen, officials of Oslo city, and representatives of diplomatic corps in Oslo. Vietnamese Ambassador to the UK Le Thi Tuyet Mai said her country always keeps in mind the valuable support given by the Norwegian people and Government throughout history, as well as outstanding Norwegian persons’ contributions to the reinforcement of bilateral friendship and cooperation. Reviewing Stoltenberg’s devotion, she said he actively engaged in a movement protesting the US-waged war in Vietnam in the late 1960s and the early 1970s. In June 1970, as a member of an international delegation, Stoltenberg and another representative of Norway visited the North Vietnam and Vinh Linh tunnel in central Quang Tri province, and witnessed the US’s war crime against the Vietnamese people. After returning to Norway, he submitted an 80-page report proposing policies on the war in Vietnam. The Norwegian Government later agreed on the establishment of an information office of the Provisional Revolutionary Government of the South Vietnam in Oslo in 1970. It set up the diplomatic relationship with Vietnam in November of the following year. On different positions such as Foreign Minister (1987-1989 and 1990-1993) and head of the Norwegian Red Cross (1999-2009), Stoltenberg strongly assisted Vietnam’s rebuilding efforts and Vietnamese expatriates’ integration into Norway’s society, Mai noted. At the ceremony, certificates of merit from Deputy Prime Minister and Foreign Minister Pham Binh Minh were also presented to Dybdahl Ragnhild, who served as Deputy Head of Mission of the Norwegian Embassy in Hanoi from 2011 to 2015, and Kjell Arne Nielsen, who was the Commercial Counsellor of the Norwegian Embassy between 2009 and 2012. On behalf of the recipients, Stoltenberg thanked the State and people of Vietnam for recognising their contributions to the foundation and development of the countries’ relations.